¶ 1 Leave a comment on paragraph 1 0 The pedagogical approach of the OpenMed course is based on Fink’s (2003) [Fink, L. D. (2003) Creating Significant Learning Experiences: An Integrated Approach to Designing College Courses. San Francisco: Jossey-Bass.] integrated approach to course design. The integrated approach is based on a taxonomy which goes beyond rote learning, or straightforward application of skills, towards the development of more creative, engaging and reflective learning experiences as both process and outcome. 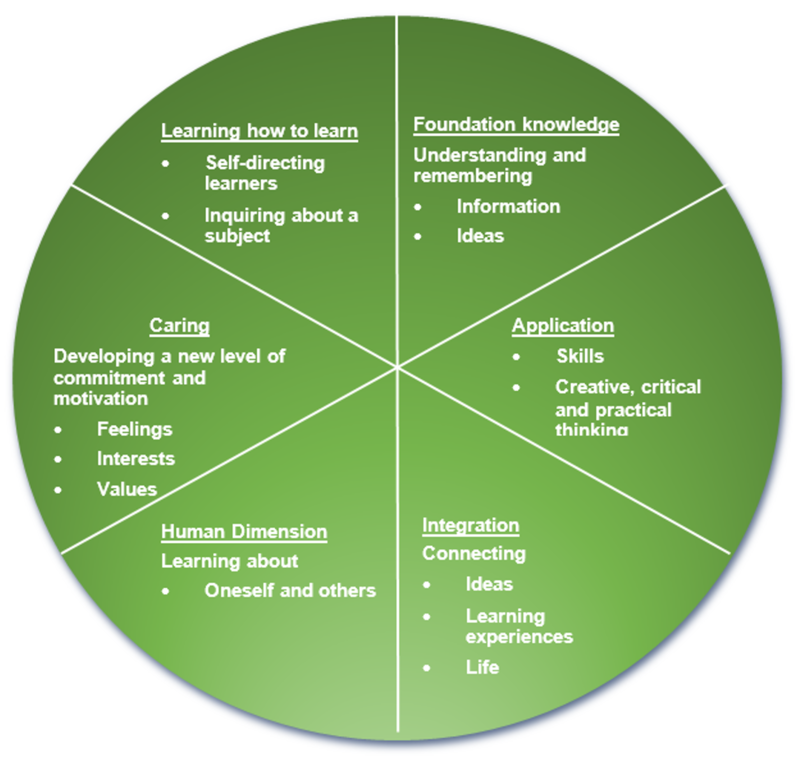 Fink’s taxonomy builds on that of Bloom (1956), by adding in elements such as the social dimension of learning, attention to human interaction and motivation, in addition to a focus on cognition. ¶ 7 Leave a comment on paragraph 7 0 The six categories of Fink’s integrated approach to learning, captured in Figure 1, are expanded upon below. ¶ 9 Leave a comment on paragraph 9 0 Knowing here refers to the learner’s ability to understand information and ideas about basic content that they need to know by the end of the course. Foundational knowledge provides the basic understanding necessary for other kinds of learning. Assessed on the course for example by multiple choice questions. ¶ 11 Leave a comment on paragraph 11 0 Application encompasses learning to apply critical, creative and practical thinking and includes developing certain skills so that other kinds of learning becomes useful. Assessment ideas here include case study work as well as independent research. ¶ 13 Leave a comment on paragraph 13 0 Seeing and understanding the connections between ideas and concepts offers learners agency and intellectual understanding, and the ability to assimilate specific and wider ideas from across disciplines and resources. Assessment here will include presentation of scenarios to demonstrate understanding and application of knowledge through use of certain techniques and approaches. ¶ 15 Leave a comment on paragraph 15 0 This aspect stresses the human factor and the significance of learning about the self and others, enabling learners to function and interact more effectively. It also includes considering why people respond and act in the way they do, and how this is shaped socially and culturally. Assessment techniques can include reflective writing, and sharing learner insights with an emphasis on interculturalization. ¶ 17 Leave a comment on paragraph 17 0 This aspect is premised on the view that a learning experience changes the degree to which we can care about something. When learners care more, they become more motivated to continue learning. This aspect therefore encompasses caring about others and the subject matter in terms of having the energy and commitment for learning and the interest and associated feelings towards the subject matter. Assessment techniques employed here will likely include the use of Likert scales – to understand how much learners care about the course. ¶ 20 Leave a comment on paragraph 20 0 Using a dynamic and non-hierarchical structure, Fink’s (2003) model proposes that when learning occurs in any one of the six dimensions, a learner’s ability to improve ensues in every other dimension, illustrating that learning is multidirectional. For example, an increase in caring about the subject matter of applying open licenses to one’s teaching resources will lead to an impetus to learn foundational knowledge about the range of licenses available through Creative Commons. ¶ 21 Leave a comment on paragraph 21 0 In promoting an integrated approach to our OpenMed course design, including the importance of aligning the learning outcomes with the teaching and learning activities developed and the techniques used for feedback and assessment, we aim for the OpenMed course to create a significant learning experience for those involved.